Russell H. Beatie is writing what should become the classic series on The Army of the Potomac. This is the second volume in the series dealing with the time from the defeat at Bull Run to the preparations for the Peninsula Campaign, September 1861 to February 1862. Readers of Civil War history will find few books on this six-month period and for good reason. This is NOT a battle book. This is NOT a campaign history. This is a history of preparation, problems, misconceptions and politics. Central to the story is George B. McClellan, fresh from victories in Western Virginia and given command of a defeated army. He determines not allow the army to be pushed into another battle. The priority is training, organization and more training. 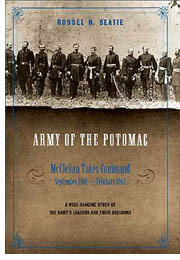 McClellan’s severest critics admit that he excelled in this job and built a very professional army from the raw volunteers. His struggle to do this is the heart of this story. To enjoy this book, you must rethink the American Civil War returning to a time before the total war when many still felt that peace without victory was possible. The newspaper’s lists of the dead and limbless men on city streets are not yet common. The war is still a great adventure to many. Acceptance of the theory that the history of North America could depend on one great battle that would establish the Confederacy or save the Union is common. Many Newspapers preach this idea, Politicians endorse it and Generals accept it. Preparation for this battle is McClellan’s goal and he works at it with a single-minded purpose day and night. The book deals with the small upsets, the friendly fire incidents, poor leadership, failed logistics and miscommunications that kept McClellan from achieving his goal. While he feels unready, the public is demand action and expenses are mounting. The major military battle is Ball’s Bluff; the major battles are the removal of General Scott and the establishment of the Joint Congressional Committee on the Conduct of the War, the first a victory and the other a defeat for McClellan. How events and personalities interact and react is the heart of this book. McClellan, Lincoln, the Radicals, the War Democrats, the press, political generals, West Point graduates all march across the pages making demands on each other and seeking advantage. The discussion on the selection of general officers; the interaction between the states and the Federal Government is worth the price of the book. It is something that you seldom see in a history but builds a real understanding in the serious student. How the War Democrats expect the war to be fought and their feelings toward the South get full treatment too. Not the standard quick dismissal but an intelligent walkthrough with “logical” reasons that supported their ideas, most of these reasons will be disproved in the coming months but for now they are “logical”. The reaction of the Radical Republicans meshes with the expectations of the people, feed by the press, to produce an overheated atmosphere of doubt. McClellan’s personality causes him to make a series of bad choices that creates an opposition movement. Unable to build a real relationship with the Republicans he is isolated, surrounded by enemies in a trap of his own making. In December 1861, McClellan is ill for three weeks. In the history of the war, this is a small event but a major one on the road to his dismissal. A helpless McClellan showed Lincoln how little he knew and how dependent fighting the war was on one person. This was not a good experience for Lincoln, who moved to correct the problem. This is not a fun read nor do we have sympathy for many for the principles and several are despicable. However, we gain an invaluable understanding of the foundation of an army and a government learning to wage war.